Alex Laing began his musical education at the Edinburgh Academy and later at St. Mary’s Music School. There he studied violin with Warren Jacobs and was privileged to have opportunities of working closely with Lord Menuhin, the School’s Patron. Alex is a graduate of Cambridge University. While studying music at Christ’s College, he also held one of the University’s prestigious Instrumental Awards, which led to master classes with The Endellion String Quartet. Thereafter he attended Birmingham Conservatoire, where his violin studies continued with Jacqueline Ross. He was awarded the Diploma of Professional Studies in Music Performance, the flagship postgraduate degree at the Conservatoire. For his final degree recital he performed the Alban Berg Violin Concerto with the Conservatoire Symphony Orchestra. While in Birmingham Alex also studied with Peter Thomas and Michael Bochmann. Alex is founder and artistic director of the Darwin Ensemble Chamber Orchestra (DECO), which is in its eighth season and has received consistently excellent reviews. The orchestra specialises in accessible classical music, and it draws large audiences across all generations. DECO also puts great store on promoting professional performers at the start of their careers. The orchestra has attracted the attention of the country’s finest performers. DECO’s first soloist was Simon Blendis (leader of the Schubert Ensemble) and other notable soloists include George Caird (oboe) and Jack Liebeck (Classical Brit Award winning violinist and professor at the Royal Academy of Music). Alex himself has appeared as soloist with DECO in Vivaldi’s Four Seasons, Mozart’s Sinfonia Concertante, Haydn’s Sinfonia Concertante and in both the Bach double violin concerto and the double violin and oboe concerto (with George Caird). Alex has a strong love of chamber music. He has been lucky enough to study with Gábor Takács-Nagy at IMS at Prussia Cove and at the Haute École de Musique in Geneva. For many years he led the Astaria String Quartet and until recently also performed in a piano trio, the Balnic Trio. He has greatly enjoyed passing on his love of chamber music to young people who attend the coaching weekend held each summer at Uppingham School. Alex also writes, both about music in general and about teaching. He has an increasing portfolio of programme notes created for DECO, recitals and for other performers and his articles on violin teaching are regularly published in magazines for the European String Teachers Association (ESTA). He is also a contributor of items for the Strad magazine. Alex is making a name for himself as an educator. 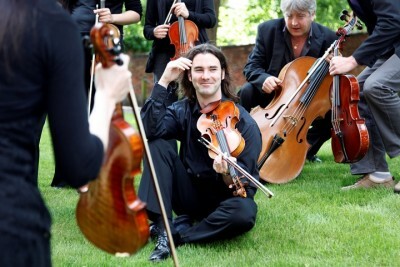 He teaches the violin and coaches the string orchestra for the Junior Department of the Royal College of Music. From 2013-2017 he was Musical Director and Conductor of the National Children’s Orchestras of Great Britain East Region and continues to act as a conductor and violin tutor on NCO courses. From 2010-2017 he was Head of Strings at Uppingham School where he conducted the Symphony Orchestra, Chamber Orchestra and Senior String Ensemble. Alex’s violin students have been awarded scholarships to study at UK conservatoires, have enjoyed success as members of the NCO and of the National Youth Orchestra of Great Britain, and have been competition winners both in the UK and in Europe. He has also coached chamber music to national standard: in three out of four years, Uppingham’s chamber musicians were chamber champions in The Pro Corda Chamber Music Festival.